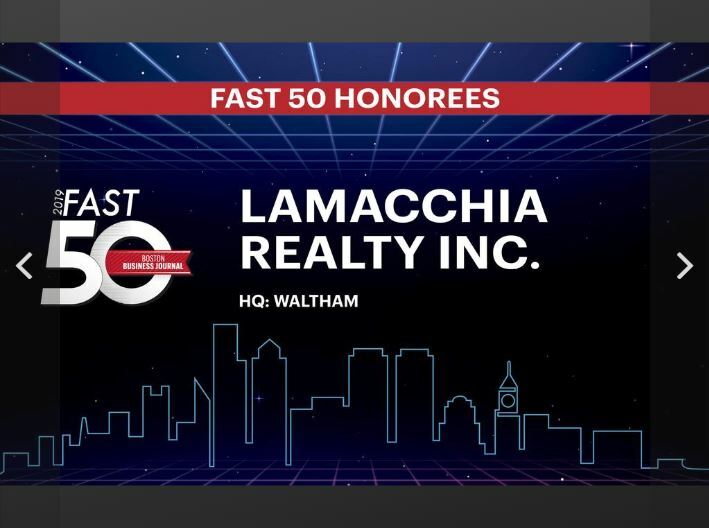 April 2, 2019 – The Boston Business Journal announced their list of the 50 fastest-growing private companies in Massachusetts which included Lamacchia Realty for the second year in a row. Honorees of the Fast 50 were selected based on their financial performance; winners were selected and ranked based on a formula that counts revenue growth from 2015 to 2018. To be considered, a privately held company needed to report revenue of at least $500,000 in 2015 and $1 million in 2018. 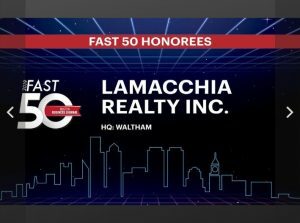 In 2018, Lamacchia Realty also made Inc.’s 2018 List of 5,000 Fastest Growing Companies in America for the 7th time in a row, and was named #1 Independent Brokerage in Waltham, Norwood, and Worcester for 2018. The company’s rapid and continuous growth is fueled by its formula of offerings to its agents. Lamacchia offers an array of unique lead products, services, and tools to its agents. In addition, the trainings, systems, technology and marketing that Lamacchia Realty offers its agents are second to none and the word is spreading. Agents have everything they need to grow their businesses at their fingertips. Agents who join from other companies on average, grow their business by 318% in their first year at Lamacchia Realty.